We spent the day resting. Hanging out with our friends, relaxing on the couch and napping. The kids enjoyed their time with friends. It sure is nice to spend time someone other than your sibling after traveling for three weeks. 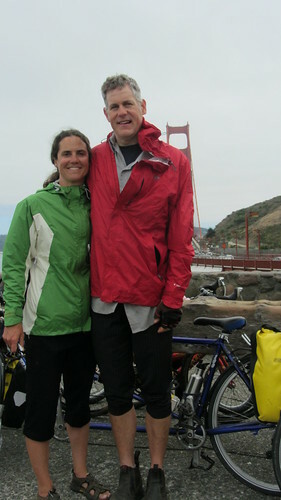 We packed up the next morning and started pedaling toward the Golden Gate. 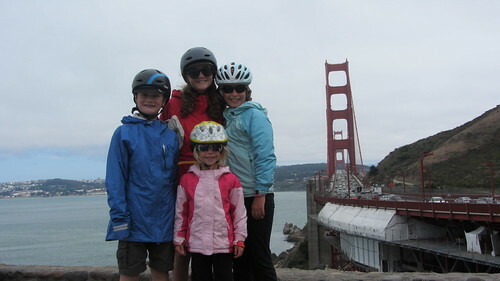 I had made plans to meet my sister, and her two daughters near the Golden Gate so they could ride the bridge with us. Of course, we got lost in Marin and the ride took longer than we had planned. We finally made it to the bridge and my sister and my nieces were cheering for us. We were elated and just a bit misty eyed! As we rode up, the 9-year-old said, “Mom, I’m really proud of myself.” I agreed, I’m proud too. Lots of photo opportunities in the viewing area at the Golden Gate. We lingered for a while and snapped lots of photos! The cousins at the Golden Gate. Our trip was officially over. 22 days, 947 miles! Tim and our daughter both said they were ready to keep going, they wanted to continue down the Coast. But we had to get back to Seattle and didn’t have time. We vowed to finish the Pacific Coast another time! We spent two days with my sister and her family. More napping. More relaxing. More hanging out with family. We were all exhausted and the parents didn’t have energy for tourist activities. The kids were disappointed that we didn’t spend more time in San Francisco. We vowed to spend more time being tourists next time! 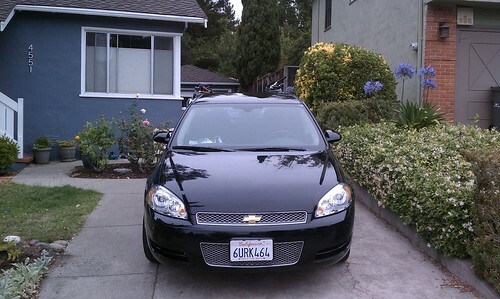 We also reserved a rental car and Tim disassembled the bikes so they would fit on the trunk rack we borrowed from my sister to transport the bikes. Looks cumbersome but the bikes don’t stick out beyond the mirrors. We drove late into the night since we had to return our one-way rental car in the morning. Thirteen hours later, we were back in Seattle. 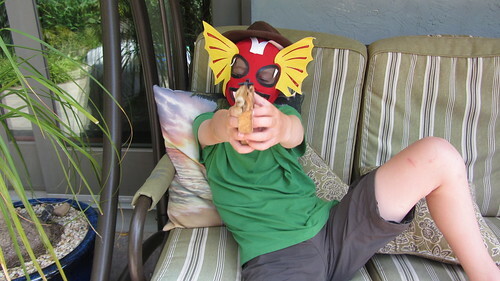 Here’s a link to our Flickr photo stream from the trip. 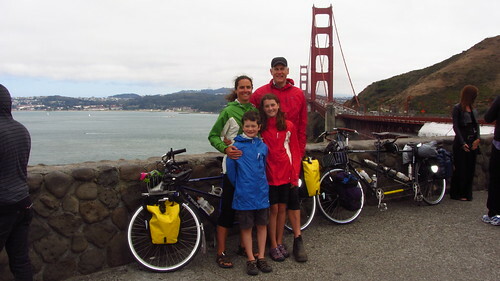 This entry was posted in bike touring, bikes, Pacific Coast Bike Tour and tagged 2012, acapaccoast, bike touring, bikes, carfreedays, family bike touring, Family Cycling, kids, OR, Pacific Coast Bike Tour, San Rafael to Oakland, tandem, tandem bike tour, two tandem bike tour. Bookmark the permalink.